30 September 2007: With more motor vehicles, roads, and parking lots than any nation on earth, the United States is renowned as the land of the automobile. Many cities have more registered automobiles than residents. The monthly car payment for American families often exceeds its mortgage payment. But in spite of America’s love affair with the car, many US mayors are now striving to make their cities more bicycle-friendly. American communities are adding bike lanes to roadways, building locker rooms and storage facilities, adopting supportive policies, and partnering with businesses to make bicycling safer, easier, and more convenient. Portland, Oregon is considered the pioneer bicycle-friendly city in the United States. Over the past 15 years, Portland has built nearly 300 miles of bikeways, including streets designed specifically for cyclists where motor vehicle traffic is limited. Portland is hardly alone. Austin, Texas, Lexington, Kentucky, Upper Arlington, Ohio and hundreds of other cities of all sizes are expanding the services they offer to bicyclists. Chicago plans to expand its network of 100 miles of dedicated bike lanes that crisscross the city to 500 miles within ten years. Chicago is guided by Bike 2015, its bicycling master plan. Wilmington, North Carolina launched a Neighborhood Traffic Improvement Program to facilitate bicycling, and Boston created the position of Bicycle Planning Director. The goals are similar in each city: reduce the number of trips made by motor vehicles, cut the number of bike-related injuries, connect schools and transit facilities to bike paths, and increase the quality of life by providing a viable and healthy transportation and recreation option. One commonality of the increased attention to bicyclists in US cities is mayoral leadership. 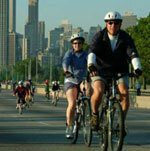 Chicago Mayor Richard Daley, for example, is an avid cyclist, as is former Los Angeles Mayor Richard Riordan. 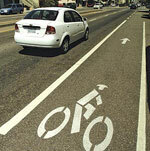 Mayor Michael Bloomberg of New York recently announced a 200-mile expansion of the City’s bike lanes. Mayor Rocky Anderson of Salt Lake City introduced and signed legislation mandating that all new roads in the city accommodate bicyclists and pedestrians. Another important catalyst is an expansion in federal funding. The US federal transportation budget for bicycle and pedestrian projects totals about US$750 million annually, nearly double the spending of ten years ago. Changes in consumer lifestyles are an equally important driver. Bicycle sales in the US increased 20% in the past ten years, according to the National Bicycle Dealers Association. Aging baby boomers view biking as an enjoyable way to exercise. Young professionals regard bicycles as environmentally-friendly and fun. And adult riders of all ages are concerned with the rising fuel prices, long commute times, and parking problems associated with cars. Businesses are beginning to follow the burgeoning market. Private firms manage bike stations in Chicago and other cities. Many companies are beginning to offer financial incentives to bicycle commuters. Millennium Pharmaceuticals in Cambridge, Massachusetts, for example, offers any of its 1100 employees who bike to work US$700 per year. Private businesses in most major cities plan itineraries, print route maps, and offer specialized bicycle tours of area attractions. Bicycle rental firms operate in dozens of cities. As a result, even cities that are notorious for unplanned growth are becoming more bicycle-friendly. Sprawling Phoenix currently has over 500 miles of dedicate bikeways. In Houston, 1000 miles of bikeways are planned, and a citizens group wants the city to build a bikeway instead of expanding a light rail line. The group argues that a bike path would be less costly, less disruptive to traffic, and take more cars off the street during rush hour than rail. This is not the first time American cities have tried to become more bicycle-friendly. During gasoline price spikes in the 1970s and 80s, many cities made ambitious plans to encourage bicycle ridership. In most cases, these plans came to nothing, in part because funding was scarce. Today, however, there is adequate federal money to help implement bicycling policies and projects. There is also a trend in American urban areas to create “livable communities,” where residents are not entirely dependent on the automobile. These factors are influencing supply and demand. As publicly-funded projects make bicycling more convenient and more useful, ridership increases. Growing demand necessitates a further response by government and business, and the momentum builds. The number of people who rely on bicycles for transportation is still small in the US  less than one percent of all trips are made by bike, according to the US Census. But the number is growing, and the strong support of biking by US mayors is certainly encouraging to advocates of a greener, healthier society. Author: John Davison, London, UK. The experience of British new towns suggests that it is not sufficient to build segregated bike ways. To attract cyclists, both locals and visitors, these have to be maintained as if they were conventional roads, regularly swept of grit and debris, and cleared where nettles, shrubs or branches encroach. When they are grade separated, extra attention needs to be paid to waymarking and lighting, otherwise they will simply fall into disuse. If a network is built and a large proportion of cyclists continue to ride amongst vehicular traffic - perhaps having suffered punctures or scratches from overhanging brambles, or alternatively one-too-many detours, then accident rates won't dip and the benefits of the network can be under-rated. If this happens it is less likely to get the expansion it deserves.